I’ve always said that using a metronome is important if you want to develop your guitar playing speed. However, there is a huge counter-argument that claims that metronomes are unmusical at best. I think that what’s really happening, is that most people don’t understand metronomes. Yes, it is an unmusical, unfeeling, machine…but at the same time it’s only a tool. Like any tool, using it the wrong way can be pretty unhelpful! 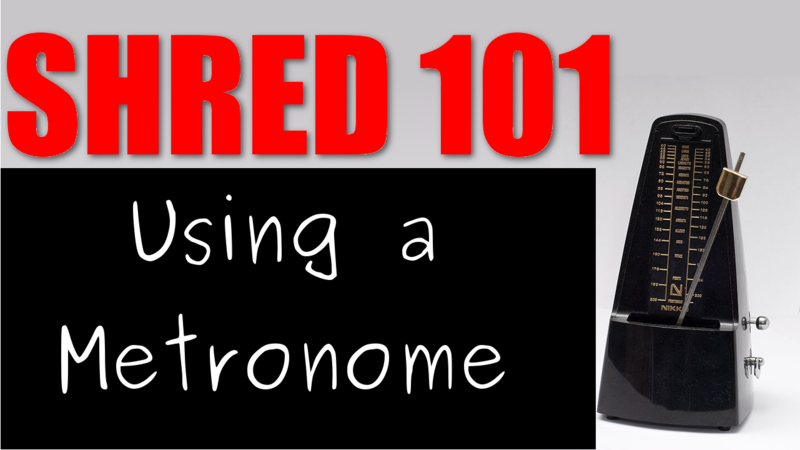 So, how can you be sure you’re using a metronome correctly? Hopefully, this video will explain! See, this is how I see most people go about using the metronome: they try to play a lick/riff/whatever at as close to full speed as possible. Then, they stick the metronome on at around that speed, and play along to it. The first reason is probably the most important when you’re trying to figure out why you seem to have hit a speed limit, or plateau. It’s the second reason that leads to more complaints- this is when the click becomes ‘annoying’. Remember: the metronome is only useful if you’re playing along with it. That doesn’t mean just playing with it switched on. There is a big difference. In the video, I explain that you need to build a connection between what you’re playing, and what the metronome is doing. This really is the key to using the metronome effectively. One of the best ways to do this is to play rhythmic subdivisions. So, put the metronome on at a slow speed, that isn’t so slow you could go for a coffee between each tick (I like around 60bpm). Then, try to match it exactly with a note on your guitar. So, every time the metronome clicks, you play a note. It doesn’t matter which note you pick at this point. Just pick only one, and play it for each click. Really try to get it exactly at the same time as the click, and this is a lot harder than it sounds! Once you can do this, you can move on to the next exercise: playing two notes per click. These two notes should be the same length. So, if what you’re playing sounds like two quick notes on the beat, followed by a gap…you’re doing it wrong. We’re after even subdivisions of the beat. Then, try to increase the number of notes you play on each beat. Even numbers are easier than odd numbers here, so start with 2 and 4 notes per click, before attempting 3 or 5. Once your comfortable with the basic subdivisions, you can apply that to your riff/lick/whatever. How are the beats divided in what you’re trying to play? Are there two notes for each beat, or three? Try tapping the beat along to the original recording (if you have it). This may help you to figure out how the notes sit in each beat. Now, put the metronome on at a slow speed, and play your riff/lick/whatever to the metronome tick. If you don’t do this part properly, the rest of this won’t make any sense at all! When I say a ‘slow speed’, I’m not just talking about what’s ‘comfortable’ to play. A ‘slow speed’ here, means one where you’re absolutely sure that you’re playing perfectly. This means that the fastest speed that you can play ‘comfortably’ is already too fast. This needs to feel slow. Trust me, even the smallest mistake at this speed will grow by a thousand times when you speed up. A mistake here will probably be the reason you hit a ‘speed plateau’, and can’t get to your target speed. So, are you playing it absolutely perfectly? Because if not, you might have problems later. Next, you can finally start speeding up. A question that I’m often asked is ‘how long do I spend on a certain speed, before speeding up?’. Well, the answer is: it doesn’t really matter. I mean, I couldn’t give you an exact time for each speed. I couldn’t even tell you how many bpm to increase the metronome by each time. None of that is what’s really important. What’s really important here, is that you speed up slowly, and watch out for mistakes creeping in as you go. I can’t tell you exactly how much to speed up, or when. If you speed up and mistakes appear, that’s either too fast, or you’re speeding up too soon. In either case, the solution is to slow down, back to a safer speed. There is one exception to this rule: when the reason you can’t speed up is actually all in your head. You see, we have to take into account thinking time. Again, it’s an easy fix. Just force yourself to play faster than you think you can, and then slow back down. If you do it right, the speed you slow down to will seem to be slower. This is purely a mind trick, but it works! When speeding things up this way, I always like to have a ‘margin of error’. This means that I’ll take something 10 or so bpm faster than I need it. That way I know that I can actually do it better than I need to. Really, you don’t just want to be able to play something on a good day. Ideally, you’ll want to play it that way on a bad day too. Therefore your ‘good day’ speed should be higher than you need it, if that makes sense? If not, there is always the comment section for questions!